"Andy is coming to her powers and others are doing all they can to control her"
Andy has to go see the Master Vampire Lucien in hopes that her slate is clean and she no longer owes him anything. As he declares her debt free, he also he also forces her to be his human servant. Now Andy finds herself with a serious problem, her job as a government assassin will be in danger if they find out she is bound to a vampire. Balancing her job and duty forced upon her by Lucien, Andy is forced to search for a missing person and discover who is behind the attacks on supernaturals in the city. As she is dealing with trying to fight and save everyone she also has to deal with the wolf pack leader who wants to mate her wolf and the local pride leader who wants to mate with her cat. The problem is both the animals in her want the men and she must decide on one. Andy is a new kind of creature and her goal is to find out what she is and why she exists. She's funny stressed and having man problems. Therefore she resonates with the reader. You really can't help but like this assassin and want her to find her true partner. Not sure which team I'm on yet, one is too good to be true and the other has a lot stacked against him unfairly. 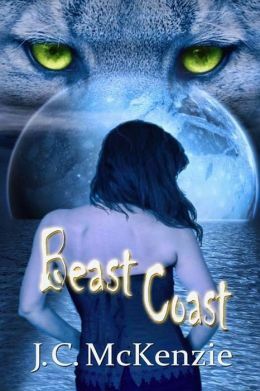 Though BEAST COAST is book two in the series it can be read as a standalone, though I recommend reading the first one also. BEAST COAST is a fun fast read that pulls you in with action and keeps you reading with a good story. J.C. McKenzie has a hit with her Carus series and BEAST COAST is a must read. When Master Vampire Lucien Delgatto threatens her potential mate Wick�s life, Shape Shifter Andrea �Andy� McNeilly will employ a den of witches, a bedazzled thong, and her ability to shift into multiple animals to meet his demands. She plans to keep Wick safe�even if she�s not speaking to him. Lucien�s unwelcome control over Wick's life has thrown Andy into a whirlwind of emotions. Though Wick vows to do whatever it takes to earn Andy�s forgiveness and win back her trust, it may be too late. This recent conflict awakens something within Andy, an animal she�s never learned to control. For hidden beneath all her forms is a beast whose anger and brutality rivals none. And she�s pissed. Whirling around, I found Wick with an ear-to-ear grin and his paintball gun resting over one of his shoulders. If he had a leg propped up on a recently deceased moose, he�d look like a hunter from a photo. �Tagged you,� his whiskey voice crooned.